We decided to film our favourites video through compiling the various things that we've been liking for the month and do excuse the quality because It wasn't filmed with a proper camera but nonetheless, we hope you like the video! 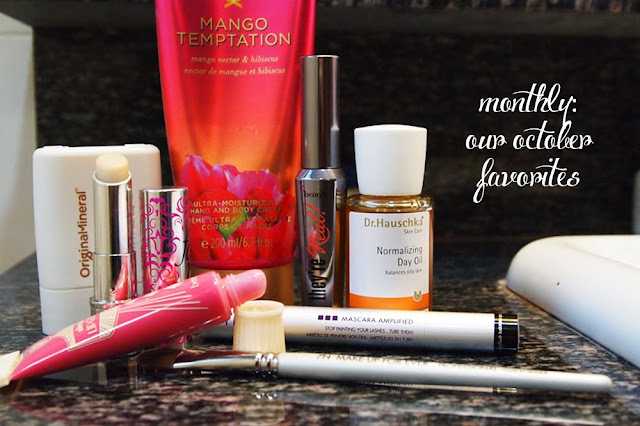 Victoria Secret Ultra- Moisturizing Hand & Body Lotion " Mango Temptation"
Benefit Ultra-Plush Lip gloss in " Lollibop"
What were some of your favourites for October? I've never tired any VS products, but Mango Temptation sounds pretty great! Mango Temptation sounds sooo luscious! And may I just say, you two look absolutely GORGEOUS!!!! On photos, beautiful - in video, much more!! More videos, girls! I was just reading your blog the other day and the photos are just so beautiful! Plus your whole layout is just so classy! It's such a pleasure to read! Hehe it's hard to think of ourselves as adorable (sometimes we go through our old videos and cringe even) but thank you!